Inscribed on plinth: KEITH R. MILLER AM MBE 1919 - 2004. 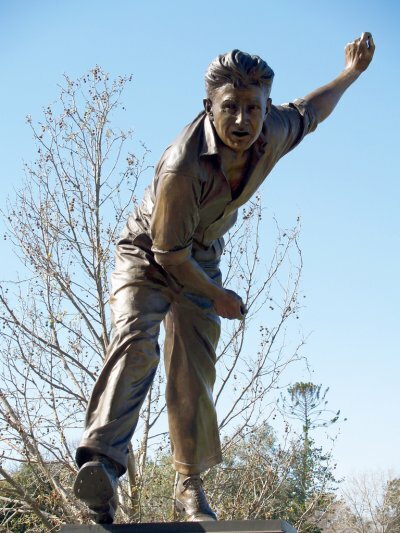 A mercurial, match-winning all-rounder, Keith Miller played 55 Tests for Australia (he also played 50 games of Aussie Rules for St Kilda Football Club), and was universally admired as one of the game`s greatest players in the decade after World War II. He represented Victoria at Cricket and Football. Tattersall's [logo]. MCC [logo]. SCULPTOR: LOUIS LAUMEN. A GIFT TO ALL AUSTRALIANS FROM TATTERSALL'S.